At this time of year, as we reflect on the past year and the upcoming months, we are thankful for many wonderful things. As organic farmers, we are thankful for the earth, the sun, the rain and the goodness of growing greens naturally. As educators, we are thankful for the bright young minds that visit, the questions that keep us learning too and opportunities to share our knowledge. As a farmer’s market we are thankful for the community that supports us, the beautiful sounds from our local musicians and for our vendors that bring such talents and diversity to our farm. As a farm, we are thankful for the efforts and hard work of our small but dedicated staff, the trust of our board members, and the insight of our founder in creating such an inspiring place. Lastly and most importantly we are thankful for our members, our volunteers, our interns, and all those that support Sweetwater through their hard work, their willingness to share Sweetwater’s story and their belief in our efforts. Thank you all for making Sweetwater possible. As summer approaches, the harvesting season here at Sweetwater Organic Community Farm will soon come to an end. In preparation for this transition, a cover crop method is used to ensure that the soil is ready and healthy for the upcoming harvest while we wait for the hot summer temperatures to pass. Why is a cover crop method used in the summer? Florida summers tend to be too hot and humid and not ideal for the growth of our plants, so we use this time to enrich the soil by planting a cover crop. A cover crop is planted during the off-season and left temporarily. 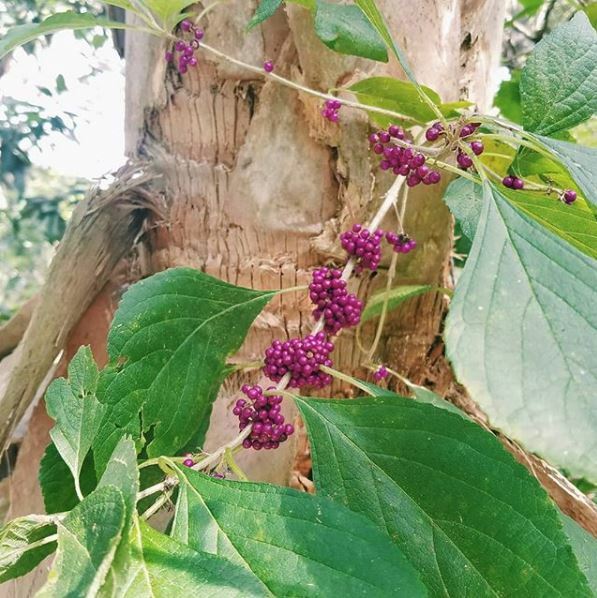 This method not only helps to control erosion, it also improves the health of the soil by enhancing nutrient cycling such as nitrogen from the organic matter which increases the fertility of the soil. Cover crops also suppress those unwanted weeds from growing. Another benefit to this practice is that with the increase in organic matter and nutrients, the soil will provide a home to microbes that indirectly protect the plant roots. So once summer comes to an end, the cover crops will be removed and the soil will be ready for the next harvesting season! 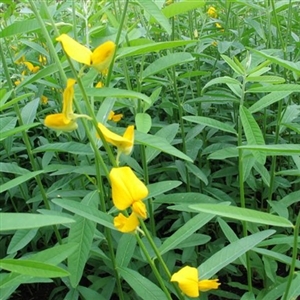 The two plants we use as cover crops are sesbania (left) and sunn hemp (right). Note: This is just one farmer’s opinion – we here at Sweetwater support your right to have your own opinion! Hey everyone, Lexi here! Just wanted to share with people interested in going vegan and people on the fence about going vegan why going vegan is awesome, easy, healthy, and yummy! Let me just list the basic reasons here first: super healthy, great for the environment, and animal cruelty-free! Eating a whole food plant-based vegan diet can prevent, reverse or even cure some of our top killers. There is overwhelming evidence that heart disease can be prevented, reversed, and even cured by switching to a plant-based diet. Cancer can even be prevented, reversed or even cured depending on which stage the cancer is in. Type 2 diabetes can be prevented, reversed and cured with a plant-based diet. Type 1 diabetes is not curable, but eating a plant-based diet can help people with this disease get off of some of their medications and feel better. Lower respiratory disease, Alzheimers, and kidney disease to name a few more that can be prevented, or reversed with a plant-based diet. No more blaming your condition on your genes. Only 3-6% of diseases can be attributed to genes. That means you have the power to control your destiny. Not only can eating a plant-based diet help prevent or cure diseases, it can also help with skin conditions like acne and eczema. It’s the ultimate guide to living a healthy life. Eating this way provides you with all of the essential nutrients your body needs: protein, beta-carotene, dietary fiber, vitamin C, folate, vitamin E, Iron, magnesium, calcium and more. So if you’re worried about not getting enough protein, now you know you will be getting more than enough because… all plant-based foods have over 6% calories from protein! People only need between 6-10% of calories from protein a day and if you eat meat you’re probably getting way too much, which can have negative side effects- I will get into that in a separate post. Plant-based proteins contain all 8 of the essential amino acids needed for health. Plants also mitigate free radicals, oxidative stress, slow down the aging process, and allow for a quick recovery after a workout because they are ant-inflammatory. If you’re an athlete eating the 4 major plant-based food groups: -Fruits, Veggies, Whole Grains, and Beans, you will be getting more protein than you need: 12-15% coming from plant friendly proteins. Check out this video to learn more about the benefits of going vegan! Because my blog is focused on the health and fitness benefits to going vegan I will share some educational videos with those of you that are interested in the environmental benefits as well as the animal cruelty-free aspects instead of getting into a long spiel about it. They are always a topic of conversation with visitors at the farm, particularly because they are very attentive hosts: they welcome everyone who visits with a curious gaze and a walk around. But aside from the benefit of having fresh eggs, having chickens at the farm has its rewards. Chickens are pest control machines: they help reduce the population of a variety of species that can affect the crops. 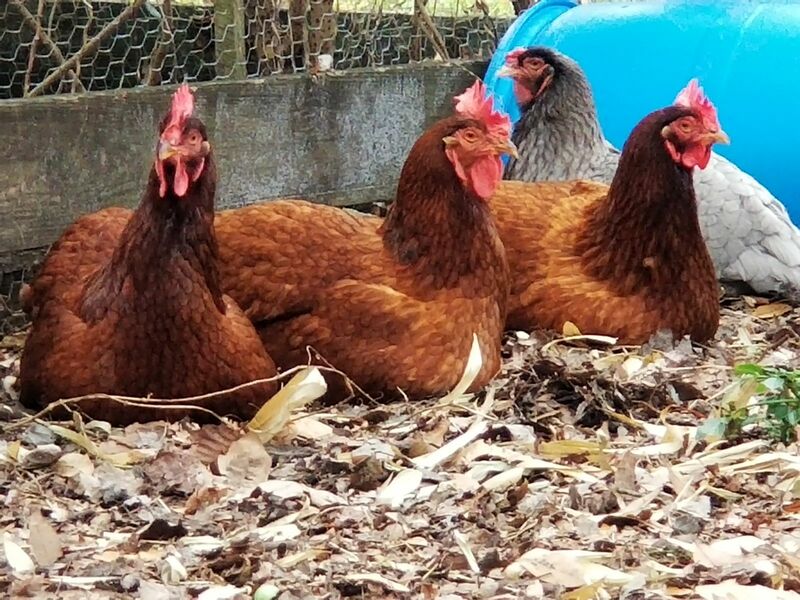 They also have a special ability to shred compost: they love to dig, scratch, search and eat, so a pile of compost can be turned and broken down in record time. But more than anything, they make great pets and companions. Now you know, the next time you come to the farm, don’t forget to say hello to Sweet Potato and the rest of the flock! They too are working to give you the best produce available with passion and dedication. The whole process takes only a couple hours: we go to the fields, harvest and take the produce back to the farm for you to pick up. But in between, there is one critical step we can’t miss: wash and prep! It’s simple, the more delicate vegetables take a nice quick bath with nothing but water in our tubs. The more sturdy root vegetables get sprayed on to get the dirt out of them. We let them air dry for 10 minutes and they are ready. It’s not just for presentation! This is the final step on our quality control, where we can look one last time for insects, parasite or any other damage and keep only those that are ready for distribution. They are still “electric” and full of nutrients by the time they make it to your table, just cleaner.. and prettier. Most of us know the benefits of composting – it reduces yard and food waste as well as energy and fuel, it’s wonderful for your plants, giving them the nutrients that they need to thrive, and it could save you money! But did you know that you can use worms to do the dirty work for you? It’s called vermicomposting – the worms turn food waste into nutrient-dense compost called worm castings. We use our vermicompost to nourish our plants in the education garden. 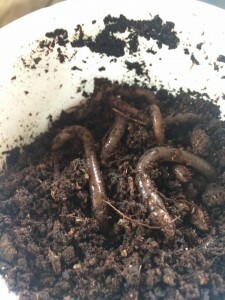 We also turn it into “worm tea,” or vermicompost (minus the worms!) mixed with water. 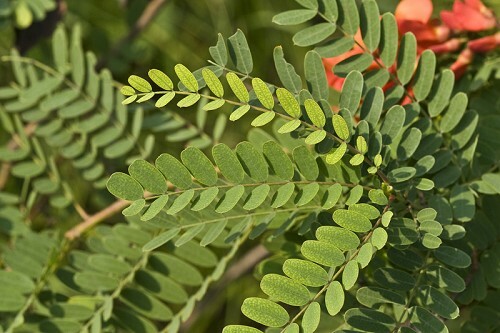 In diluted amounts, it acts as a natural fertilizer, while in more concentrated amounts, it acts as a natural weed killer! If you’re ready to start vermicomposting, here’s a great guide to get you started! This is our hardening shed, or transition area. Think of the greenhouse like nursery school. 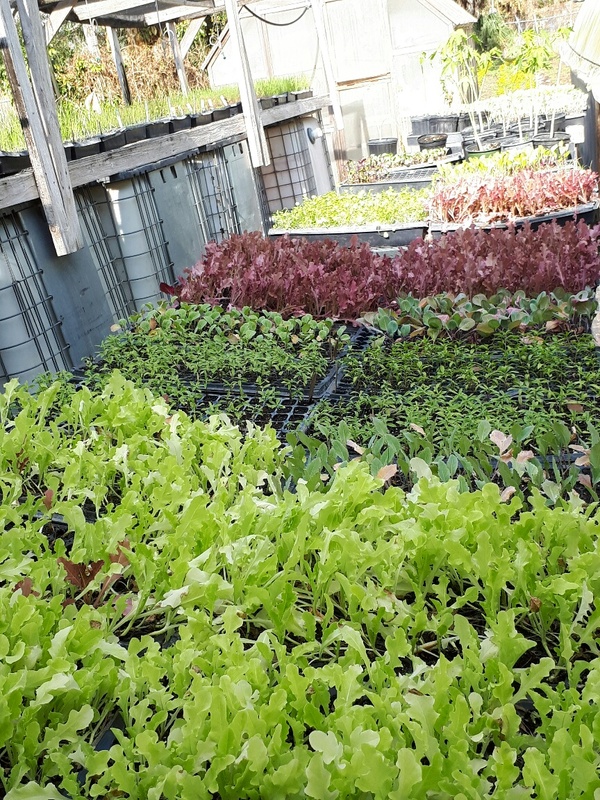 The baby plants have everything controlled for them – food, water, temperature. When they’re old and strong enough to go outside, we transfer them to the hardening shed. This is more like middle or high school – we still control their food and water, but they’re a little more free to spread their wings and grow strong and hardy. They’re teenagers (thankfully, without the usual moodiness). Finally, we send them off into the real world, or plant them in the fields, to grow big enough to harvest and bring to you at the market or in your share! With just a handful of full-time farm staff, apprentices, and interns, we rely heavily on our amazing volunteers. They help us with every aspect of production, from planting seeds to harvesting to washing vegetables. They help man the market booth on Sundays, set up for events, coordinate our workshops and live music series, and take fantastic pictures of our pet chickens. And some of them get REALLY into the farm spirit! When you volunteer with us, you’re joining a community of people who care about the earth, their neighbors, and great food! No matter who you are or what your reason for volunteering, we want you to join the farmily! This week, the crops are recovering from the frost. The peppers, eggplant, and tomatoes have all been harvested. We will continue to have green tomatoes and sweet peppers in the CSA for at least this week – be sure to check out the Recipes tab on our website to find out what to do with those! Also in the CSA this week are different colored broccoli and cauliflower. Brassica species like broccoli, cauliflower, Brussels sprouts, and cabbage love the cold! When there’s a freeze, those vegetables get sweeter and tastier! The other upside of a freeze is that the plants that didn’t survive have now been broken down and will make beautiful soil in which new plants will grow! The farm is in a constant state of renewal! 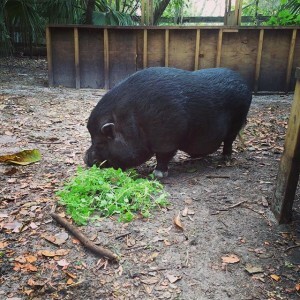 This week, the farmers prepared the crops for the bitter Florida winter. It’s expected to be in the mid to low 30s for at least a couple more nights! To prepare, we’ve buttoned up the greenhouses – this means that we’ve brought everything not yet planted in the ground inside the greenhouses and covered the houses with side panels. The panels will allow some air flow but protect the plants from frost. We’ve also covered some of the mature lettuces in the fields. Just like humans, baby lettuces are more resilient than their more mature counterparts. 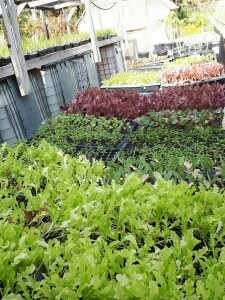 They’ll bounce back after the frost, but the mature lettuces either need to be covered or harvested before it freezes. Expect to see an influx of warm weather vegetables at the market and in the CSA share. Plants like eggplant, tomatoes, peppers and lettuces can’t survive long in the cold, so we’ve harvested the majority of them and will be passing them on to you! The green tomatoes are delicious as is – or you can let them ripen on your counter. According to a study conducted by the American Farm Bureau, 72% of consumers know “nothing” or “very little” about farming or ranching. But it doesn’t have to stay that way! 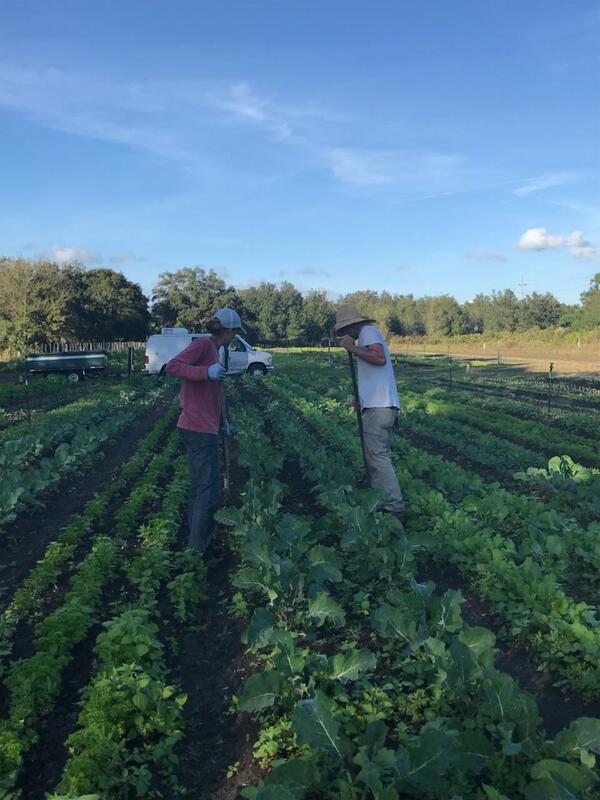 A major benefit of shopping at Sweetwater Sunday Market is that we’re the only farmers market in Tampa Bay located on a working farm. That not only means that you get to shop where your produce was grown, it also allows you to meet the farmers and learn all about urban farming direct from the source. 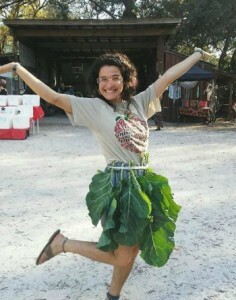 Join us for a free farm tour the first Sunday of every month or attend one of our workshops or cooking demos! Like us on Facebook so you never miss out on an exciting event! Brand new homes for our beloved animals! As part of the ongoing beautification efforts around the farm, we’re demolishing the chicken coop and pigpen and building brand new ones! 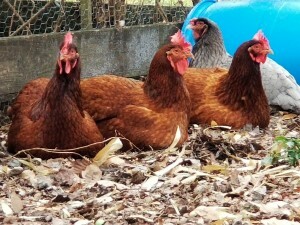 Sweetie (our pot-bellied friend) and the chickens will be much happier in their beautiful new abodes. Thank you to our Board of Directors President Doug King and to M.E. Wilson Co. for donating their time and demolition skills to this effort! 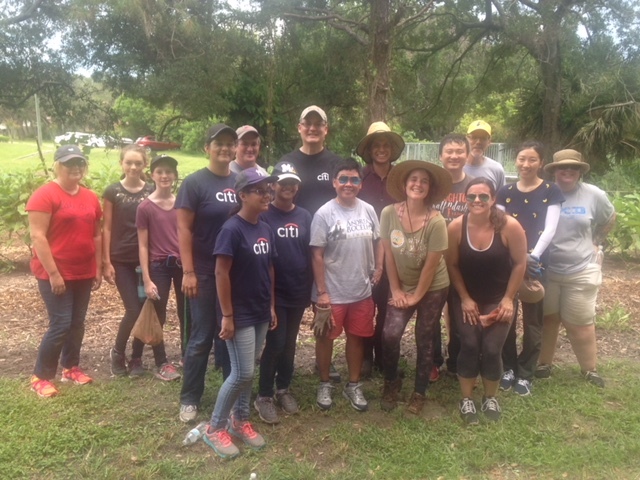 And join us for a barn raising volunteer day – stay tuned and subscribe to our newsletter to find out when that will be! There’s no place like the farm for the holidays! Kyle and Lexi are busy scuffle hoeing (or scuffling, as we usually call it)! A scuffle hoe is used in a back-and-forth “scuffling” motion to eliminate young weeds before they have a chance to grow a stronghold. The hoe is designed to keep you upright, so it’s much easier on your back, and it won’t damage the surrounding plants. 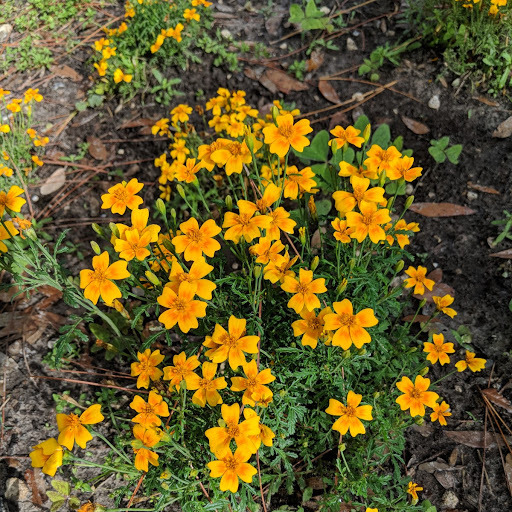 It’s ideal for the loose, sandy soil we have here in Florida. If you’re stuck for ideas on what to make with all the farm fresh greens that you can find in your CSA and at our Sunday market, try this recipe for a Greens Galette! Or fool your meat-eating friends into thinking they’re eating bacon (maybe…) with this recipe for Sneaky Collards! And don’t miss out on our holiday events and workshops on Sundays this month! Come sing your heart out during our holiday sing-a-long and attend our Intro to Permaculture Workshop and FREE farm tour this Sunday, 12/17! Please help support your planters at the beginning of our harvest season and purchase your tickets for the Planter’s Ball ! Saturday. November 18th is the big day. The “seed” money from this event helps keep your farm going and growing! Vegan And Gluten Free options available and as always kids 12 and under Free. An interview with Farmer Nick! Nicholas MacAskill is 26 years old and originally from Michigan. He is named after Santa Claus thanks to his older sister. Nick moved down to Tampa after earning the apprenticeship position at Sweetwater. He attended Lake Superior State University and left with a Bachelor’s of Science in Conservation Biology. He loves Batman and the momentary silence that occurs when you drive under an overpass in a rainstorm. If you were to be a fruit/veggie what would you be? What are your duties at Sweetwater? I am an apprentice but will be a part time farm hand the start of the 2017 season. I am involved in all the steps it takes for a seed to become a mature, harvestable plant. Thus, I do a WHOLE lot of weeding, feeding, treating, mowing, and harvesting. How often do you work, and who do you work with most? I currently work 40 hours a week basically Monday thru Friday, but I will working about 20 to 30 hours once the 2017 season begins. I work most with Farmer Jenise, the farm apprentices, and farm interns. Who is your favorite person to work with on the farm? Who is your favorite animal on the farm? Definitely not Sweetie! The striped cat that does not have an official name, and I call it a different name ever week. I am still deciding between Albus, Gandalf, Dumbledore, Gnomey, or Bruce. What do you do when your not working on the farm? I usually hike, kayak, read fiction books, write stories, eat Chik-fil-a, volunteer, and go to singing lessons. Fall in Michigan! Cider mills are the best! Hair…But in relation to farming, I would say weeds and green beans! Basil and anything in the summer! Why do you like organic farming? I like organic farming because I enjoy being outside and getting dirty and the crops we produce make me feel good when I eat them. I also enjoy the challenge and all the wonderful people it attracts. I farm because I want to be able to produce healthy food for myself and my community, and I want to do the Peace Corps. My favorite recipe is anything that produces brownies. What would be the best tip to give future farmers from you? Flexibility is a virtue in farming. Changes in weather, machines going down, or just unforeseen circumstances happen frequently, so you have to adjust the plan and keep pushing through. Also, honey is a miracle remedy on ant bites if you put it on right after the attack. One of the important stops we make when giving farm tours to the public, is at the back of the property right past the playground. It might look like a bunch of useless pool equipment from afar, but what is it really? This contraption of parts is really a well that pulls water from the Florida aquifer. The water that we pump from the ground is untreated, and simply runs through a UV light filter to get rid of anything unwanted. After this, we have our water! By doing this process we are able to water our crops with untreated water. Tampa’s city water is treated with a number of chemicals for the public to drink, bathe, and use. Chlorine, ammonia, sodium hydroxide, and the list goes on with how the city of Tampa treats its water. As a certified organic farm, we want to keep our crops as whole, and up to USDA organic standards as possible, this is why we choose to use our own water. But what is the Florida aquifer, and what’s so special about it? It covers not only Florida, but parts of Georgia, Alabama, Mississippi, and even South Carolina! It is one of the most productive aquifers in the world, and was found to be in existence in 1936. Because of the Florida aquifer, we have a number of natural springs such as the famous Weeki Whachee Springs, and others like Rainbow Springs. The aquifer supplies about 824 springs, and the majority is in Florida. When it comes to our crops and veggies, we want it to be in the purest form. We only use water from our well to grow our crops, and when it comes to distributing them to the public we do a quick dunk to clean off any debris with city water. With all organic certifications, we are required to do a number of different tasks to keep our farm certified. This ranges from record keeping, to crop-rotation requirements, land requirements, and how we fertilize. You can learn more about what goes into the guidelines for organic crop certification at the USDA’s website https://www.ams.usda.gov/sites/default/files/media/Crop%20-%20Guidelines.pdf.